(From right to left) Chethika Hapugalle, General Manager of Double A Sri Lanka, Thirawit Leetavorn, Double A Senior Executive Vice President, Saranga Alahapperuma, Director General Central Environmental Authority, and Ivor Mahroof, CEO Metropolitan Office Pvt Ltd.
Colombo, Sri Lanka – Corporate guests representing Top 100 corporations in Sri Lanka attended “Sustainability in Action, Better Paper, Better World”, organized by premium paper maker Double A and in partnership with Metropolitan Office Private Limited, one of Double A’s key distributors in Sri Lanka. Double A paper is produced using high quality fiber from Double A Paper-Tree on KHAN-NA, a sustainable source of pulp from Thailand which is grown by more than 1.5 million farmers. This unique and sustainable agro-forestry helps alleviate poverty among Thai farmers through additional income, all while providing Double A with high quality fiber. Double A is also self-sufficient in water and renewable energy. Water is sourced from its own rainwater reservoir while renewable biomass energy is from production waste such as tree barks and black liquor. “Double A and Metropolitan have been in partnership for over 15 years, the first and oldest distributor for Double A. With eight out of ten Sri Lanka companies using at least one printing device marketed by Metropolitan , we a leader in the printing and imaging solutions sector, making paper one of our key consumables to the large client base. 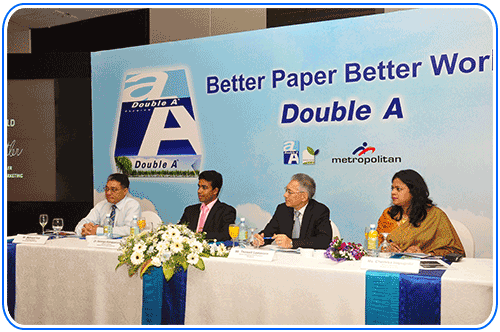 We are proud to partner with an environmentally friendly brand such as Double A,” said Mr. Ivor Maharoof, CEO Metropolitan Office Pvt Ltd.
“For more information about Double A Sri Lanka, visit: http://www.doubleapaper.com/lk/ or like them on Facebook: https://www.facebook.com/DoubleA.Srilanka.